Universal Fittings (also known as CP, Claw or Crowfoot couplings) are quick acting couplings that are used for low-pressure air or water applications up to 110 psi, such as on hoses leading to jackhammers (do not disconnect while under pressure). 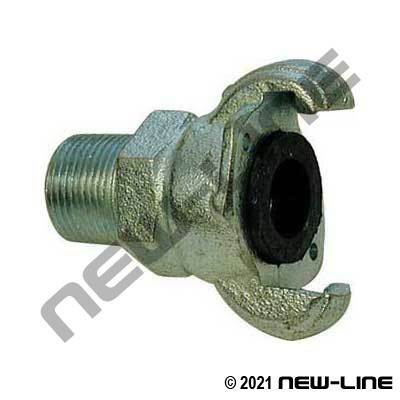 These couplings are not suitable for steam service, and it is recommended that safety clips are always used to prevent accidental disconnection from vibration or twisting. All locking heads are of one size, regardless of the hose or pipe size. Our N30 series are unbranded, competitively priced universal ends while our N3xD line and AM- Air Kings are domestic lines that are manufactured to stricter tolerances. For British pipe threaded (BSP) applications, we also offer N32BP/N33BP/N34BP European Plated Clawfoot ends (they do not interchange with the standard North American Style Universals). Universal's are also available in Auto-Locking on request. Note: We DO NOT recommend crimp sleeves on 1-1/4"-2" 4-lug cast iron Universals, the cast barb design is not compatible with modern crimping technology, 1-1/4"-2" 4-lug Universals should not be used in critical applications, it is a relatively poor and unsafe design for proper coupling integrity - especially if used in applications subject to pressure and/or temperature. It is recommended that Dixon Boss or Campbell Viton Seal Ground Joint Couplings and Clamps in larger diameter air hoses.